For more than a decade, software teams have benefited from agile development methods. They have adopted these incremental development practices, where solutions evolve through collaborative development. In this article, I will be talking about what is continuous integration and what are the Benefits of continuous integration. Let’s start off by explaining what is CI and we will then enumerate the main benefits of continuous integration. Continuous integration (CI) and test-driven development (TDD), as part of architecture-based approach, extend basic agile practices enough to provide both high quality and project flexibility. Continuous integration (CI) was created for agile development. It organizes development into functional user stories. These user stories are put into smaller groups of work, sprints. The idea of continuous integration is to find issues quickly, giving each developer feedback on their work and TDD evaluates that work quickly. With TDD, you build the test and then develop functionality until the code passes the test. Each time, when you make new addition to the code, its test can be added to the suite of tests that are run when you build the integrated work. This ensures that new additions don’t break the functioning work that came before them, and developers whose code does in fact “break the build” can be notified quickly. Agile methods allow software and systems teams to respond quickly to the changes. Continuous Integration helps systems development teams be agile and respond to rapid business changes, while at the same time ensuring that the actual hardware and software under development are in constant sync. CI allows team members to work effectively in their domain groups, focused on the tasks that they’re best at accomplishing. At the end of each day, they know that their contributions to the project are integrated and that the component parts work together. And if something doesn’t integrate, it’s quickly discovered. From a technical perspective, Continuous Integration helps teams work more efficiently. These teams can be cross-functional, they can be geographically distributed, because the constant integration work will ensure that you don’t get deviating designs. People can work on a large team, because the different components of a complex system will more assuredly work together. It solves many of the early pitfalls that these nontraditional agile teams might have experienced without CI. Combining Continuous integration with test-driven development puts more people under the agile umbrella, because it allows agile methods to work more efficiently. 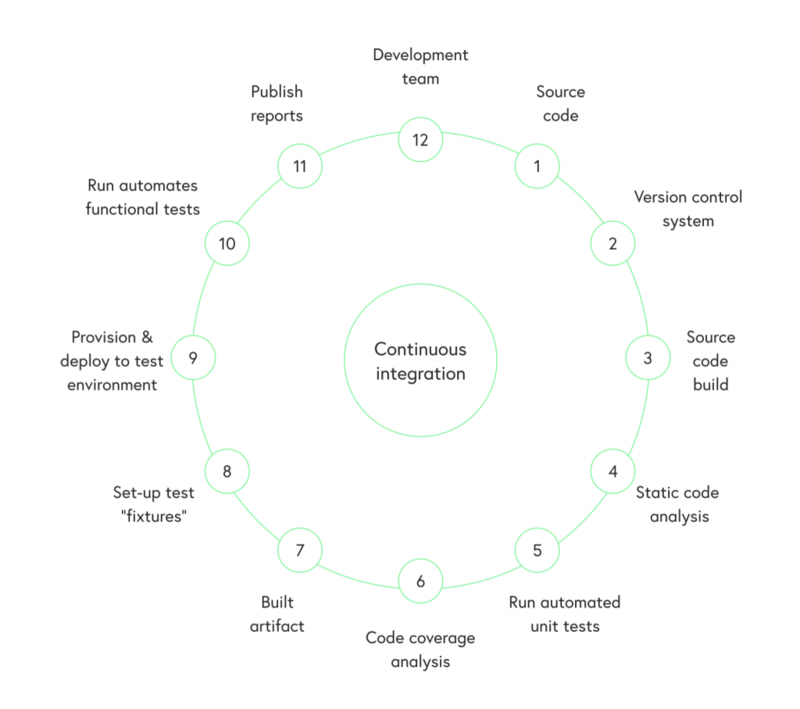 Continuous integration is a software development practice where members of a team integrate their work frequently, usually each person integrates at least daily – leading to multiple integrations per day. Each integration is verified by an automated build (including test) to detect integration errors as quickly as possible. Many teams find that this approach leads to significantly reduced integration problems and allows a team to develop cohesive software more rapidly. The goal of Continuous Integration is to provide rapid feedback so that if a defect is introduced into the code base, it can be identified and corrected as soon as possible. Continuous integration software tools can be used to automate the testing and build a document trail. From a business perspective, there are many benefits of continuous integration and it offers better business results, they can bring products to market faster, by finding issues when they are young and small, not waiting until they are large and more difficult to fix. They can also respond better to requirements that are introduced while the product is being development. This creates a better product for the customer, which is the real promise of agility. Also, if you’re looking for software development companies that could help you with one of your projects, here’s a list of great software development companies in Europe, give it a look! If you are working on a software project and you need help with Continuous Integration, please contact us, we will be happy to discuss your project! Why is software architecture a must?